If you have a budding filmmaker in your family, Animation Studio is an inspiring way to get them started with creating their own stop-motion movies. Created by Helen Peircy – an animator herself – Animation Studio delivers everything you need; all you need is to add a cell phone or camera. And while it might be on sale in your local bookstore, this isn’t a book per se. It really is what it says on the tin – an animation studio. Indeed, first of all, it’s actually a box; albeit a box that opens up to be a freestanding studio set for a “spooky house”. Inside the box is a cast of cut-out characters that you can use to animate your scenes as well as props and other objects that might be useful for your story; there’s two additional backdrops (a beach scene and an alien space planet) that can be propped up inside the studio, and then there is the book which is packed with well illustrated explanations of the history of animation as well as the different types of animation and how they are each created. Then there are the guidelines for getting the most out your own production. The author is, herself a professional animator and this set has been created largely from the knowledge and tools she uses to run her own workshops, so here you can learn how to make stop-motion videos like a professional – from a professional. Using tips and tricks from the experts, kids discover 2D and 3D techniques with puppets, clay-modelling, morphing and pixilation. 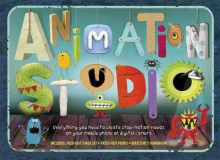 From storyboarding to the editing suite, this little studio holds everything that a first-time animator needs to know inside this mini stage set box and offers a hands-on way to learn about animation. Once you’ve got the hang of it all, there are also gadgets to make, double-sided fold-out stage set, press-out props and a 32-page director’s handbook as well as ideas for that debut movie. Even if you never make a movie, this is a fantastic space to explore all kinds of imaginative play and story telling, but best of all, you could soon be documenting all that storytelling on a movie that you can keep forever (not to mention share on Youtube). Author notes Helen Piercy studied Graphic Design at Norwich University College of the Arts gaining a first class honours in Animation, and an MA from the National Film and Television School. Her graduation film Goodbye Mr Pink premiered at Edinburgh International Film Festival and went on to screen at festivals worldwide. She runs animation workshops in schools and communities throughout London, working with children of all age groups and abilities. She has directed an animated short narrated by Alan Rickman and her clients include the World Wildlife Fund, BBC Radio One, London Fashion Week, Sky Arts and Sadler’s Wells Theatre. Fun fact Author, Helen Peircy travels the world running animation workshops. If you’re interested in attending one or learning more about animation, check out her website and schedule.